At Edgar Brandt Advisory, we put the strongest emphasis on work as a team effort. Consistently delivering at the highest professional standards requires sharp minds meeting on substance. We therefore provide an environment that lets our junior colleagues grow substantially from a client standpoint, and our partners be firmly in touch with substantive engagement issues. Hires at analyst level typically have two to four years experience with major auditing or consulting firms. 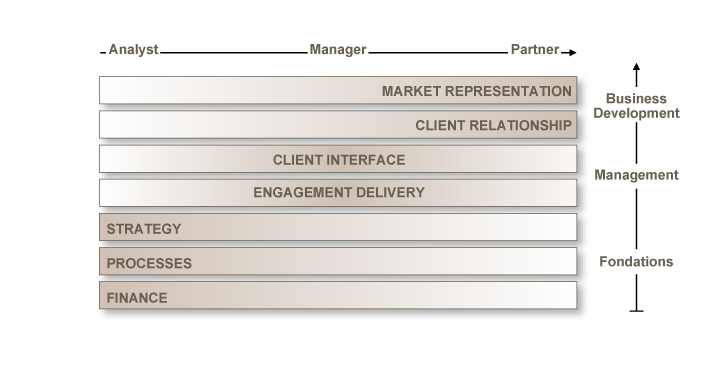 The figure below summarizes the steps and expectations of a career with us.